Lovin' Lyrics Music Promotions: EVENT (RALEIGH, NC): SATURDAY OCT 31 - 94.7 QDR HOWL-O-WEEN HARVEST BALL AT CITY LIMITS SALOON FEATURING HUNTER HAYES, CHASE BRYANT, CHRIS LANE AND MO PITNEY! 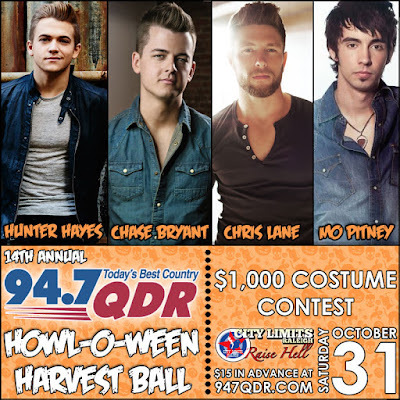 EVENT (RALEIGH, NC): SATURDAY OCT 31 - 94.7 QDR HOWL-O-WEEN HARVEST BALL AT CITY LIMITS SALOON FEATURING HUNTER HAYES, CHASE BRYANT, CHRIS LANE AND MO PITNEY! The only scary thing about this lineup is YOU not being there to party with us! 94.7 QDR and City Limits Saloon invite you to an unforgettable Halloween night blowout - the 14th Annual QDR Howl-O-Ween Harvest Ball! Dig into a freaky, fun night with your Q Crew on Saturday, October 31st at the Howl-O-Ween Harvest Ball hotspot City Limits Saloon! Haunting the City Limits stage this year are Hunter Hayes, Chase Bryant, Chris Lane, and Mo Pitney! You could even win your share of $1,000 (split between 3 winners) in the costume contest. This party will rock and it's all to help homeless animals find forever homes! Proceeds from the event will be split evenly between the Durham APS, Johnston County Animal Protection League, Wake County SPCA. These tickets will sell out quick so be ready to click it and ticket Friday morning, August 21 at 10am ET! Cost: $15 Advance - Tickets on sale on August 21st at 10am. Click here to buy tickets. This is an 18 and over show only! ID WILL BE CHECKED AT THE DOOR! NO EXCEPTIONS.